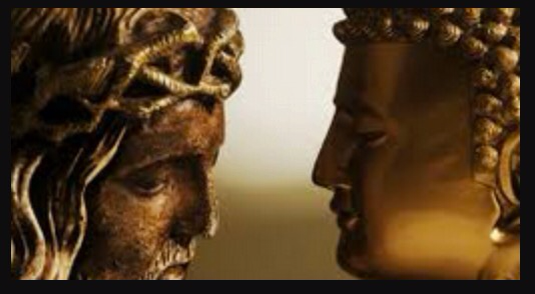 Christianity and Buddhism have many crossovers; Thich Nhat Hahn has explored them well in his twin books Living Buddha, Living Christ and Going Home: Jesus and Buddha as Brothers. A growing number of Christians find themselves incorporating Buddhist principles into their own Christian praxis. Purists will find this unacceptable; those on the outside might accuse us of cultural appropriation; but a larger number of people understand that both religious systems aim to orientatate the practitioner away from impermanent, constructed illusions and toward the true source of permanence. While this may not be the most nuanced explanation of both traditions, it holds true: Jesus and Siddhartha both saw the ways in which cultural forces can keep people in cycles of pain, suffering, and despair, whereas a dedicated change in perspective can help one see Truth. Both Christianity and Buddhism instruct us on how attachment to impermanence leads to desire that produces suffering. We want to change our circumstances (for a wide variety of reasons), and act without thinking of ramifications; we mistake the part for the whole; we assert a manufactured sense of self (likes, dislikes, desires, fears, hopes) as though it is permanent, and when we feel it is damaged, we lash out to avenge the hurt. The language used in both traditions may be different, but the underlying message is shared: you are not who you think you are, and that false you is the enemy. This means that the dedicated religious life involves hours of reflection, meditation, study, and prayer. Who am I? The ideas in my head? The desires and aspirations I pursue? The feelings I have or relationships I establish? Why do my emotions arise in such a way that they trigger a desire to act in manners that might be destructive? Counterproductive. Painful. In pursuit of relationships and community, do I do so so that I can be praised? Am I asserting my will on others in ways that decrease their autonomy or impinge upon their personhood? Do I elevate myself, engaging in puffery? The work is real, yo. And it continues. Last night in discussing 2 Corinthians with the wonderful Bible study group I lead at the church, we were talking about what it means to be confident in Christ. Paul encourages the people in Corinth to understand that they can undertake any sufferings (for those sufferings connect us to the sufferings of Jesus) and be filled with confidence (not because of their own deeds but rather as a result of grace through faith) because they know that all things come from God. But Paul also understood that such wisdom is not achieved by simply declaring Jesus Christ as Savior. It is not magic. Paul wrote about the Christian life as requiring maturity; in order for us to grow up spiritually and to put away childish things, we have to think about what it means to be clothed in Christ. Jesus told us that we cannot serve God and Mammon; Paul tells us we cannot serve ourselves and Jesus. As Jesus declared himself a slave to humanity, so we must declare ourselves slaves for God. And what does God want us to do? To serve others. To love justice. To walk humbly on the path. I find it hard to quell my ego sometimes. I’ll be specific: I think credentials matter. Education matters. There are reasons for why I underwent the training I did, and will continue to further my knowledge and skills. I find myself citing credentials with a startling regularity, and I often wonder if it arises from ego. I feel disrespected, especially when people with little to no formal training begin espousing opinions which are not based in any real understanding of the issues at hand, or act as though an unlearned opinion is equally valid simply because it is arrived upon earnestly. I feel pulled between a desire to affirm people where they are and a desire to stop the perpetuation of a culture that no longer recognizes expertise. It is especially tricky being a person responsible for spiritual life; disagreements that might occur in another context take on extra weight when spirituality and faith are involved. This is a real struggle for me. Trying to eliminate ego does not mean that feelings are no longer hurt, or disappointment is no longer experienced. It means that the emotions can be experienced and understood differently, but the sting and discomfort remain. I have no desire to remove myself from human experience, but I do want to increase my patience and compassion, slow down my reactions, consider situations from different perspectives, and always to have compassion and love as motivators. Dying ego, living self.